While decorating the interior of your home why the kitchen should be left behind? Shouldn’t it be designed keeping in mind its requirements and also the latest trend which is in fashion? Kitchen cabinets makeover your kitchen by making things arranged and proper. Currently there are many trends running for good kitchen cabinet design like light and simple, efficiency inside, customized drawers, wooden doors, metal drawers, etc to name a few. Choosing any one of these can help you redesign your kitchen in an innovative way. Kitchen cabinets become an essential commodity. You need a kitchen cabinet to keep the kitchenware and cutlery and various containers there. They should be well designed and they should suit the overall look of the interior of your rooms. Kitchen Cabinets Surrey gives a perfect solution as it provides good kitchen designs and also helps in the installation of the cabinets. Kitchen Cabinets Surrey designs are made such that they meet your needs. The kitchen cabinets installation will be done in such a way that there is enough space for other important valuables in your kitchen. Our kitchen design won’t look suffocated, not even in kitchens which are small. 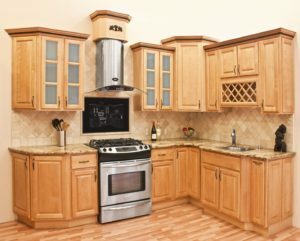 The Kitchen Cabinets Surrey makes use of each space of your kitchen that would have otherwise remained useless. Such cabinets put aesthetic value to your otherwise dull kitchen. Even a low ceiling won’t be a hurdle in the kitchen installation. The cabinets are well crafted with attention to detail. These cabinets give a beautiful finish to your kitchen. A variety of designs are available for your cabinets. If you have kitchen that doesn’t provide you enough space to keep the important stuffs then you do not have to worry that you might have to get rid of some stuffs or that you have to keep the elsewhere. Kitchen Cabinets Surrey is the solution. We give enough space for every commodity. You get what you ask for; let it be wine rack, surface space, room for dishwasher, cupboards, etc. It doesn’t matter if your kitchen is small. A variety of sizes and ways are available that make you cabinet adjust in the space allotted for it and without compromising on the design and beauty. The kitchen looks luxurious after the installation of such cabinets. The plus point is that you do not have to compromise on your needs and demands. Cabinets also give the cook a comfortable and pleasing feeling to work in. Things become easily accessible in such cabinets. It reflects the planned and clever use of the space of your kitchen. A kitchen that you had dream of becomes a reality, perfect.